Today the author talks about book covers. Enjoy! I think we’ve arrived at a golden age of book covers and all things book design. I say this because I have a new problem when I go to bookshops now … before I used to get lost in my reading, lose track of time and get in trouble for being late. I even managed to miss a flight once at Charles de Gaulle airport in Paris. Like all book lovers, I know that bookshops are not shops at all but portals. They are gateways to a several world: true tales, tall stories and raw talent. With strict instructions to be out within forty minutes, these days, I hardly get any time to read at all. And this is because I dawdle over the covers, distracted by artwork that draws the eye and makes you pause before you’ve read a word. I want to own almost every new book I see these days – even the ones about knitting – and so I keep picking books up and putting them down and moving on. Relevance can be a problem, to be blunt. When I eventually do settle, I find myself wondering why they went for a cover that seems to be nothing to do with the book. 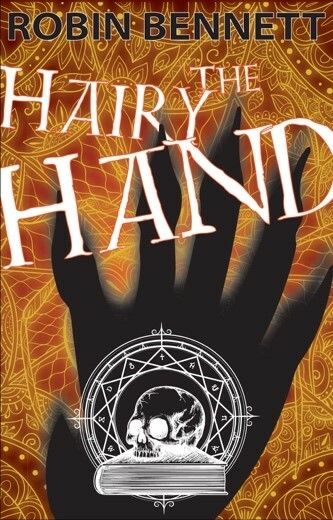 This is confusing but it’s a problem I was faced with regarding my latest book, The Hairy Hand (out at the start of 2019, buy it immediately … for it will change your life). Except it’s not quite that, I think – it’s also an adventure story: you could say that, at its heart, it’s a journey for young Sept, the protagonist. It’s also got jokes – quite a lot, in fact. The knuckles on Nick’s hand holding the mouse went white. ‘I hate working for you,’ he muttered. ‘No you don’t,’ I replied. So, in the end we went for gothic but it could have gone either way and, some of the other covers, whilst not as aesthetically pleasing, I rather liked. What I will do then, is make sure that some of the ‘prototypes’ feature on the website http://www.monsterbooks.co.uk. It would be fascinating to get people’s feedback. One element of the cover I am very happy with, though, is the spine. Books spend most of their lives showing only a very small portion of themselves. The spine seems to be somewhat neglected. Thank you, Robin Bennett and RachelsRandomResources.